Ten of us gathered on a frigid night, 9º F, with a wind chill many degrees below zero. 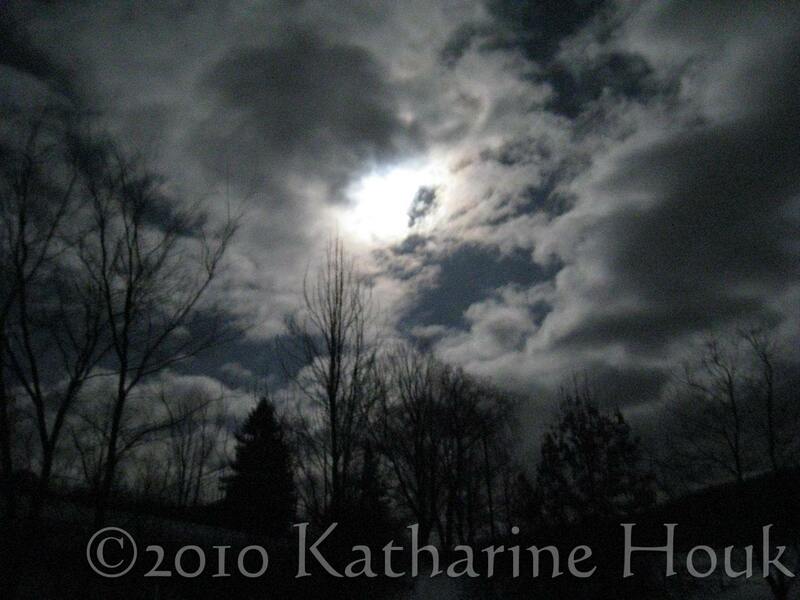 Clouds were racing across the sky, hiding and then revealing the big, silver moon. We were bundled up, thus able to take the time we needed for this snow labyrinth experience. Candles in lanterns made of ice cast a warm glow across the snow, as we followed the winding path. At the center, we each paused to look at the moon and reflect on the journey. Right after we left the labyrinth, a coyote howled in the woods nearby. That set us to howling, too! 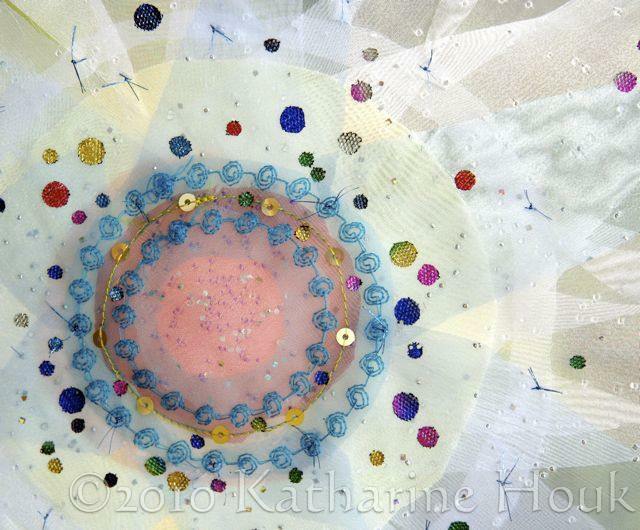 Beautiful, Katharine! Your little camera did a great job in very hard conditions. It was a lovely night! And many thanks to you, our labyrinth builder extraordinaire! When I checked just now the thermometer read 4 degrees F. Yet last night in the labyrinth I barely felt the cold. A beautiful, wild Wolf Moon! The frigid cold was exhilerating. The flickering ice lanterns beckoned us on. The moon coming from behind the clouds graced us with her presence. 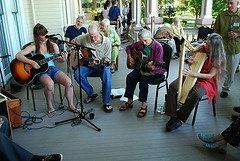 Concentrating on the senses and the walking until we gathered inside for warmth and companionship. Many thanks. these pictures are incredibly beautiful, katharine and I can feel the joy of walking the labyrinth. Wow, that looks like an intense and wonderful experience! It was beautiful. And challenging, but fun, to photograph it. Katharine, greetings from Caim Cairngorm in Virginia! 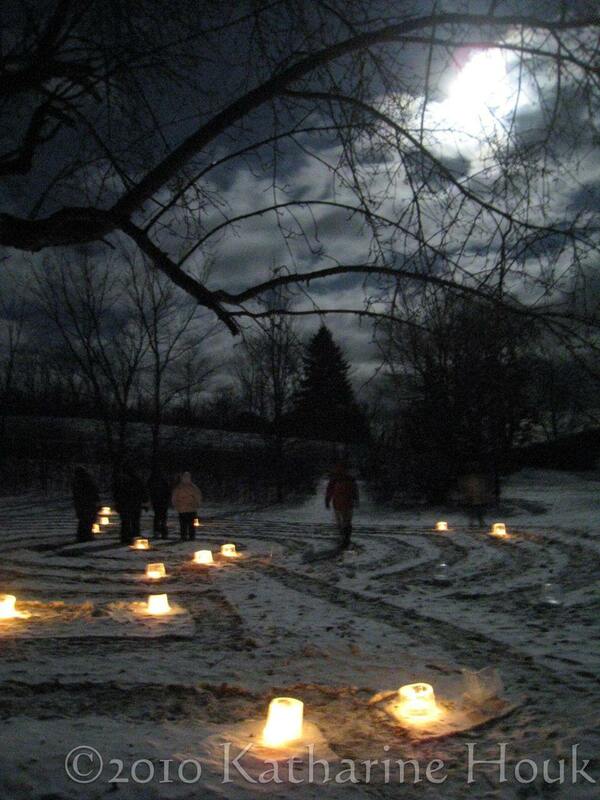 I am so thrilled to know that we were walking our snow labyrinths — a great rarity here — under the same full moon. 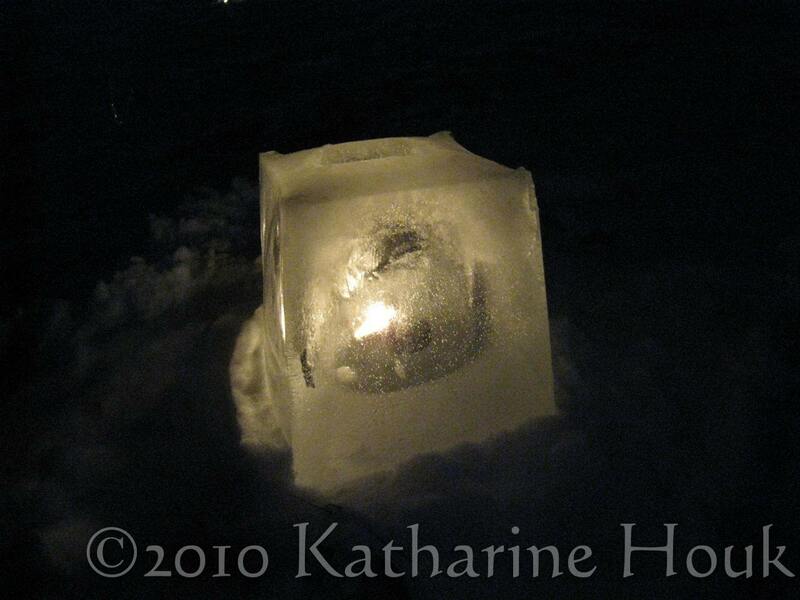 If there is enough snow to do it again another year, I’ll have to try making ice lanterns. Yours are so beautiful. Sue, Thank you for your comment. Amazing that we were walking snow labyrinths at the same time! 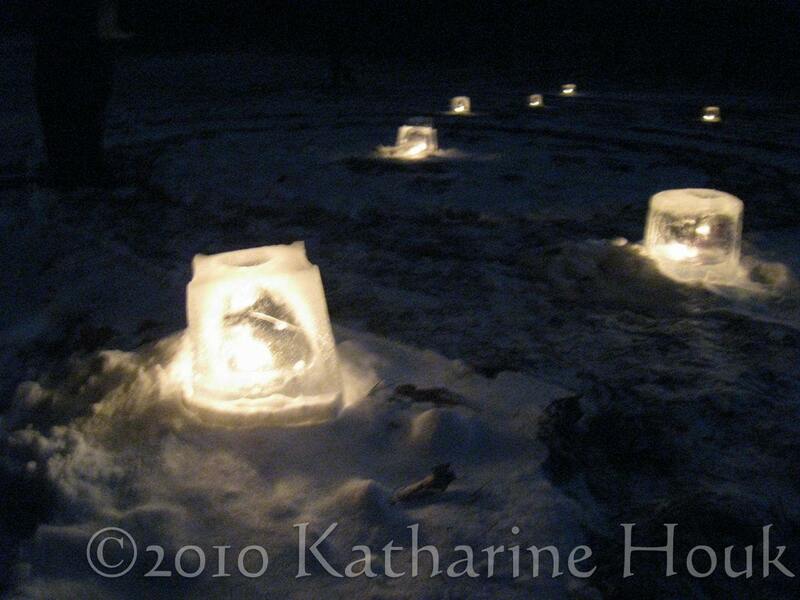 My friend Sharon made the ice lanterns and sculpted the labyrinth. Visited your website, lovely! Please stop by again some time. Wow! I would love to do something like this. I celebrated the solstice last month outside, and it was transformative. Engaging with nature in winter, especially with the night, is invigorating yet lacking unfortunately for many of us. Thanks for sharing your experience! Thanks for stopping by, Kellie. 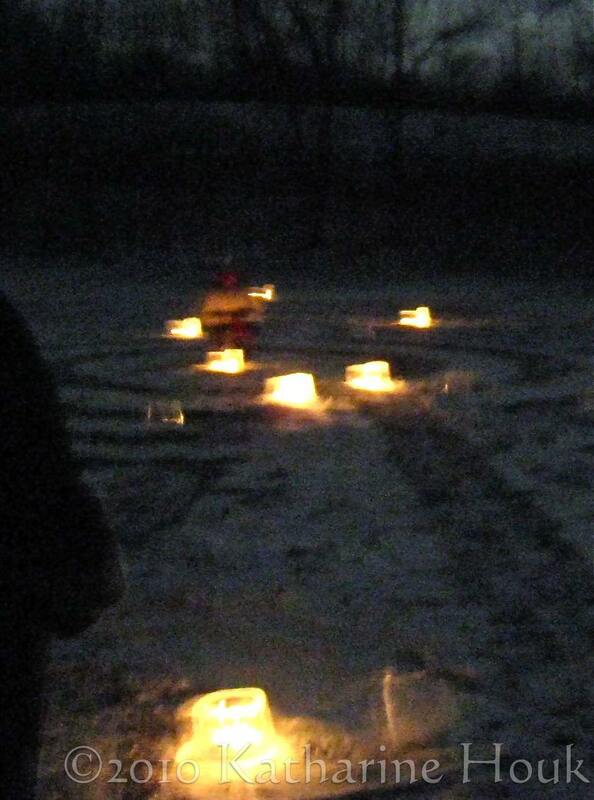 A winter labyrinth has developed into a beautiful annual tradition for us.